Is politics a zero-sum game? Imagine, for a moment, if Sen. John McCain (R) had somehow won the presidency in 2008. How might the country be different? We would not have the Affordable Care Act. Sonia Sotomayor and Elena Kagan would not be on the Supreme Court. And the stimulus passed at the outset of McCain’s presidency would probably have been considerably different from the one passed under President Obama. Oh, and there’s this: Democrats would probably still control the House, and they’d certainly still control the Senate. That’s because the president’s party almost invariably pays a price for holding the White House, a price that can be measured in the loss of House representatives, senators, governors and state legislators. Take a look at Chart 1, which examines the electoral history of the 12 presidents who served after World War II. 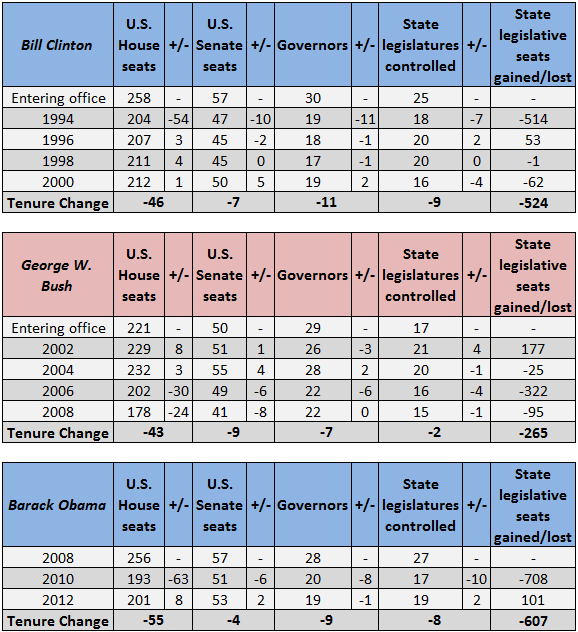 Generally speaking, presidents left office with their parties having smaller House and Senate caucuses than when they arrived, and also fewer governors and state legislative chambers — often dramatically fewer. 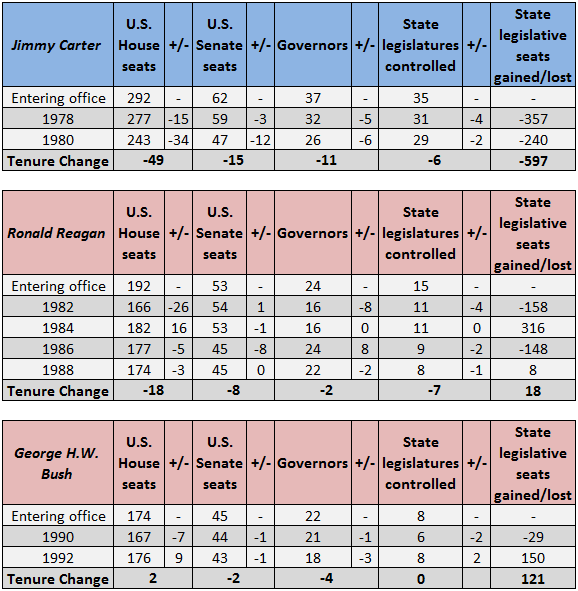 All in all, these 12 postwar presidents lost an average of 30 U.S. House seats; six senators; eight governors; total control of six state legislatures; and about 360 state legislative seats over their tenures. That includes Obama’s losses, even though his final tally remains to be totaled. Notes: *The party lineups at the start of a president’s term in office reflect the results of the prior national election. 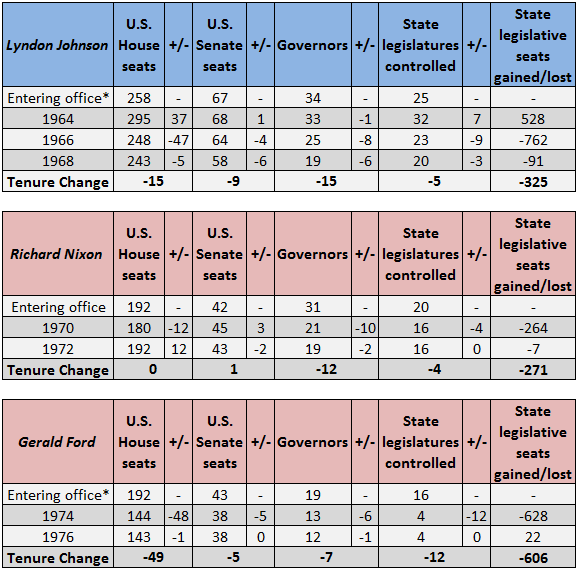 For instance, the composition of the House and Senate listed when Lyndon Johnson took office reflects the results of 1962’s election (any special elections that might have occurred between the midterm and when he took office in November 1963 are not reflected in his starting point). The same is true for Harry Truman, whose starting position reflects the results of the 1944 election, and Gerald Ford, who starts with 1972’s results. Independents are not included in these totals. State legislatures controlled means control of both Houses of a legislature (Nebraska is not included because it is technically nonpartisan and definitely unicameral). Sources: Vital Statistics on American Politics 2011-2012 for the makeup of the House and Senate at the beginning of each congressional session; The CQ Press Guide to U.S. Elections, Sixth Edition, for the total number of governors after elections held in even-numbered years; and the National Conference of State Legislatures for information on the makeup and party control of state legislatures. Overall, just three of 11 presidents left office without seeing their party incur major losses in these down-ticket races, but all three of them have major caveats. John F. Kennedy was assassinated a year after his positive (by presidential party standards) 1962 midterm, which occurred right after JFK’s triumph in the Cuban Missile Crisis. Lyndon Johnson rode a wave of sympathy for JFK, a strong set of early legislative accomplishments and a weak Barry Goldwater presidential candidacy to secure big gains up and down the ballot in 1964, but these gains receded in 1966. Had Kennedy lived, it’s easy to imagine that he might have also suffered an unhappy midterm in 1966, assuming his likely reelection in 1964. Richard Nixon, with his resignation in August 1974, decided to walk before they made him run (to borrow a Keith Richards line). Had he hung around for the 1974 midterm, the huge Republican losses in that year would be on his ledger, not Gerald Ford’s. It’s possible the GOP losses would even have been larger. And while George H.W. Bush largely kept the House and Senate in a state of stasis in his single term, he didn’t make it to a second midterm. Meanwhile, the two-term presidents on this list all suffered big losses at some point of their term that left their party in a weaker position than when they entered office. Dwight Eisenhower’s tremendous personal popularity couldn’t save him from a disastrous, economy-driven midterm blowout in 1958. Ronald Reagan suffered big losses in the House in 1982 and then big losses in the Senate in 1986. Bill Clinton never regained the House after 1994, although he did leave office with a split Senate that Democrats later controlled (thanks to Vermont Sen. Jim Jeffords’ party switch in 2001). Obama, after his smashing victory in 2008, received the bill for his victory in 2010: His Democrats lost the House and saw their Senate majority greatly reduced. The Democrats bounced back in Obama’s reelection win, but not by enough to win back the House. Currently, Democrats are down 55 House seats and four Senate seats from their position at the opening of the 111th Congress. The second President Bush had a good first midterm — 2002 — but the double whammies of 2006 and 2008 left his party in shambles. However, a backlash against Obama resuscitated the GOP, at least in the House, just two years later. That’s how it goes in American politics and in our two-party system: Success in a presidential election often invites later failure. The tides of victory overwhelm the opposition, but then quickly fade back into the sea. The setbacks for the president’s party during that person’s term can basically be summed up this way: Bad stuff, often having to do with the economy, usually happens during a president’s term, and he and his party are held responsible to some degree; if that stuff is really bad and happens before a president is up for reelection, that president could get the boot; and if the people can’t punish the president for the bad stuff, then they punish his party. That’s an oversimplification, but you get the point. Since World War II, the president’s party has gained a net number of state legislative seats in just one of 17 midterms: George W. Bush’s 2002 midterm. (This election was a rare positive for the president’s party across the board — the exception that proves the rule, given the unique impact of Sept. 11.) The loss of power by the president’s party can be particularly damaging in election years at the start of the decade. For instance, Republicans had total control of 25 out of 50 state legislatures after the 2010 elections, which was their highest mark since 1952. Given that state and federal legislative districts are drawn at the start of a decade to coincide with the U.S. Census, the timing for Republicans was exquisite. They were able to draw favorable districts in many competitive states, like Michigan, North Carolina, Ohio, Pennsylvania and Wisconsin, while Democrats had comparatively fewer places to squeeze redistricting to its fullest (Illinois is really the only notable state where Democratic redistricting greatly aided them in 2012, although the Party of Jackson did benefit from “nonpartisan” redistricting plans in places such as Arizona and California). For reference, there are about 7,400 state legislative seats spread across the 50 states. Again, let’s just imagine what would’ve happened if we hold all else equal in 2008, except that McCain wins instead of Obama. Not only do Democrats probably retain their state legislative power (they held total control of 27 states after 2008), but they also would probably have retained influence over redistricting in at least some of these aforementioned states. Again, Obama’s 2008 victory — and his subsequent rebuke in the 2010 midterm — has had long-term repercussions for Democrats. For example, it is possible that the 2010 election essentially ceded control of the U.S. House to the Republicans up through the year 2022, when the next redistricting takes effect — determined in good part by the outcome of the 2020 contests. 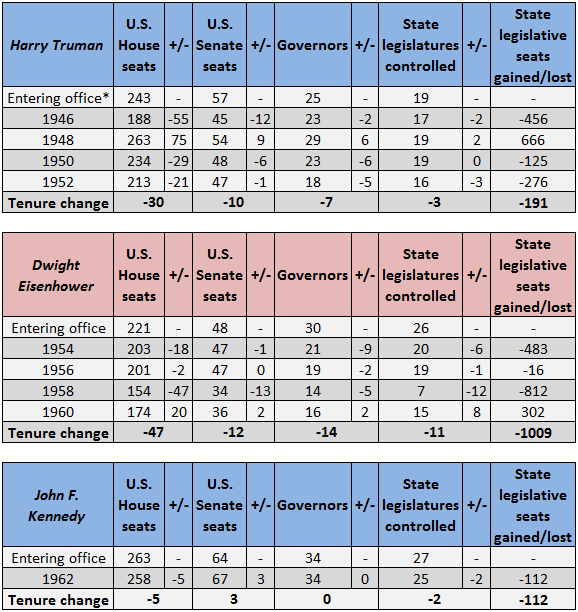 Meanwhile, no postwar president left office with more governorships than when he entered office. This is not to suggest that the presidential trophy is some sort of cursed, booby prize, like wearing Sauron’s “One Ring” in Lord of the Rings or being named the drummer of Spinal Tap. The American presidency is immensely powerful, and the person who holds it has wide latitude to craft national policy; ladle out immense portions of patronage and powerful lifetime appointments; and, effectively, start and end wars abroad. But winning the presidency has its downsides, too — if not directly for the person who holds the office, then certainly for his or her party. Now, explain to us again why so many senators, members of the House, governors and state legislators work hard to elect their party’s presidential nominee? * A special thanks to Tim Storey of the National Conference of State Legislatures for providing the state legislative data used in this article. Tim is a long-time friend of the Crystal Ball and an authoritative source for information on state legislatures.